A number of UK retailers are reported to be interested in buying the store chain of the Littlewoods group. A £500m ($943m) unsolicited offer last year from Asda, the supermarket owned by Wal-Mart, is said to have helped spark a formal sale process. Asda's non-food product lines, including its George clothing range, are becoming an increasing important part of its business. 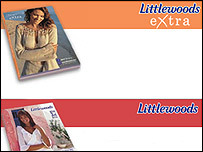 Any sale would leave Littlewoods with mail order and finance-based interests. Sir Frederick and Sir David Barclay bought the business, which now has 186 Littlewoods and Index stores, for £750m in 2002. According to The Sunday Times, New Look and discount chain Primark have also approached the company about buying some or all of its stores. Others retailers are also now reported to be set to enter the bidding, including BHS entrepreneur Philip Green, who unsuccessfully tried to buy Marks & Spencer last year. The Sunday Telegraph, meanwhile, says Littlewoods' owners are "testing the water" and are understood to want to sell the stores as an entire package. The group's stores are understood to have annual turnover of about £1bn and enjoyed a 5% increase in like-for-like sales in the six months to October. Littlewoods were unavailable for comment. An Asda spokeswoman declined to comment on the report.